Can anyone ID these coilovers? 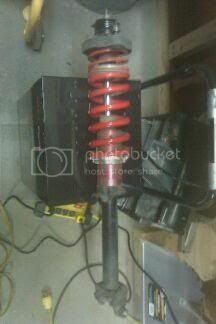 found a guy in CT parting out a Base due to a wreck, but he apparently has some aftermarket parts, exhaust, coilovers, lips, etc.. anywho, he sent me a picture of the coilovers, can anyone ID these? Re: Can anyone ID these coilovers? Looks to be ground control coilover sleeve. yea, it's a coilover sleeve, not a full coilover shock. Ususlly the stock shocks don't last very long when using them which is why people get a better shock such as Koni yellows or KYB AGX's....I remember when I first bought my coilover sleeves and used my stock shocks, and ended up blowing them things within a couple of months. Last edited by Prelude1897; 01-06-2011 at 12:58 AM. No idea I told him to see if he could pull a name or part # off of them.. pretty sure ill pass on them.. but he did say hell have the oem lip kit in a few days. looks to me like they are skunk2 coilovers on stock shocks, so shocks are more than likely no good, and IMHO $200 is not worth it. I have friends who baught the eBay springs and I have skunk2 on my lude and they are exactly the same. DONT BUY! they look exactly like weapon R coilovers. They are cheap ebay crap. You have to cut your own shock to make them work. I would only get some if they were new and I was doing the work myself. ya definitely not ground control coils. i have em in my lude and ya those arent the same, other then the fact that they are red..
you know the saying "you get what you pay for" ..? ya suspension is one thing you dont want to go cheap on. you'll hate yourself in the end for it. i get goin cheap on like a intake or something like that. but something like the springs your gonna be riding on, you want quality. i have ground control coil overs on stock struts on my lude. had them for about 2 years now, and love them to death! ride is really smooth, but still hard strong into the corners and such. do your self the favor, get your set of gc's, preferably some camber kits(but they can wait) and some poly bushings all around(also can wait, but easier to do it all at once).